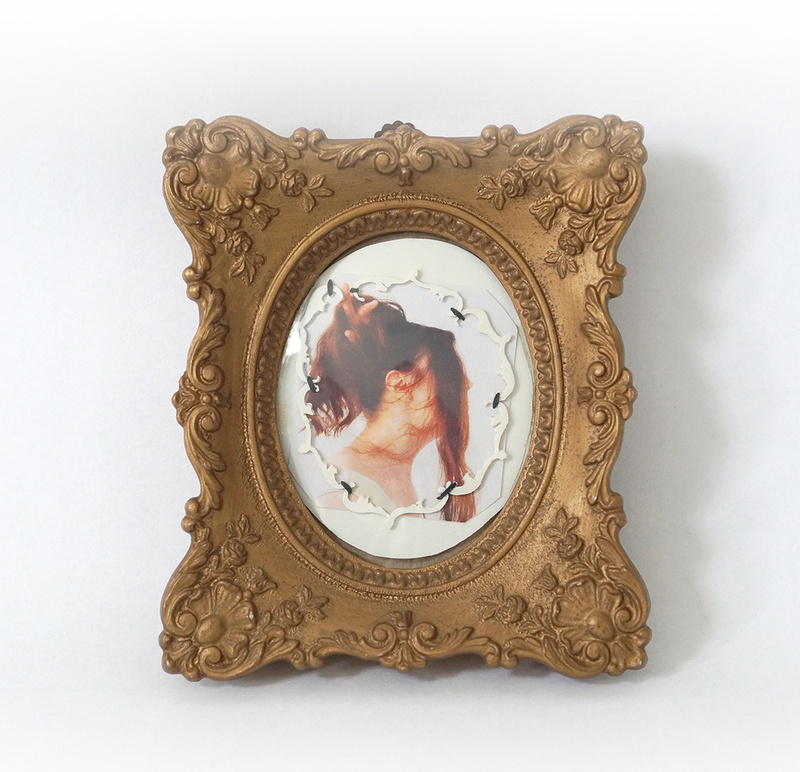 Patricia Sullivan, “Cameo Relief of Woman Holding Her Hair.” Vintage painted shadow box frame, vintage glass, brass hardware, digital photo on archival paper, microwaveable soup bowl material, thread. 5 in. L x 4 7/8 in. W x 7/8 in. D, 2015. For nearly eight years, I’ve broken up my studio work days by enjoying healthy vegetarian soups at lunch. One afternoon I realized that these pre-packaged containers holding the soup ingredients are so sturdy and well-made to survive the hot temps of the microwave; its fibrous housing appears so pristine in its ivory, “sheet-like” material. After noticing these were designed to be cast off and thrown away, I started preparing my soups in a true ceramic/handmade bowl while saving these ivory-like beauties to take into the studio. The circular ornaments that surround and define this cameo wall relief are hand-sawed, pierced and filed into organic forms reminiscent of textile patterns by using traditional metalsmithing techniques. I delicately hand-sew these pieces and permanently attach them to the photograph with black thread to create a cameo. I refer to my new raw material as a “socially-conscious ivory”. 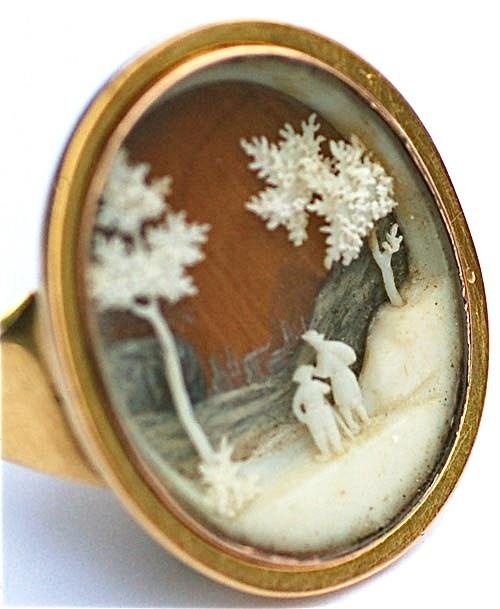 Georgian Period Micro Ivory Ring, circa 1780. Multi-dimensional micro-ivory scene, set under crystal. Photo used courtesy of Rowan and Rowan, London. NO genuine ivory is used, only the left-over fiber materials that I transform into decorative artwork instead of landfill fodder. With these disposable soup containers and lids designed and cut/pierced by hand, I hope to transform it into a precious object and thereby prevent its disposal. In the French-Georgian period of history, creating vignettes with micro-ivory scenes was a popular artistic practice and quite elaborate especially due to its miniature scale. The photograph of the woman in-profile is captured by me digitally and manipulated with a filter; the subject’s pose holding her hair and ballet-like hand gesture is reminiscent of popular Victorian-era portraiture. By placing a rectangular portrait behind this created oval “frame” of ornaments, I seek to show how this female subject is worthy of more than just the viewer’s “gaze”. Her profile is obscured by her hair and not engaged in the “classic cameo” pose. While this cameo is a self-contained object, it is designed to be a wall-hung relief within the vintage frame. I’m quite excited that this piece will be exhibited in the upcoming Shadow Box: A Group Show, curated by gallery owner Laurie Kearney at Ghost Gallery in downtown Seattle, Washington. This wonderfully diverse exhibition featuring over twenty artists is set to open on Thursday, August 13th with a reception from 5-9pm at the gallery and continue through September 3rd. Shadow Box will also be available starting in early-to-mid-August with an online preview event. Wow! So much to say about this, Patricia. First of all, we truly are on the same wavelength. I see what you mean now about the similarities between your latest piece and the self-portrait I captured the other day. (Funny, too, because after I uploaded it I kept having visions of cameos.) Second, what a gorgeous — and eco-friendly — work of craftsmanship! “Socially-conscious theory:” I dig it. You have a wildly creative mind to upcycle a soup container in such a way. And finally, how exciting that you will be exhibiting again at Ghost Gallery! Does this portend a trip to Seattle for you and Brian? Gina, I’m so happy that you follow my logic w/ this piece. I’ve been experimenting w/ this material for nearly two years but nothing “spoke to me” on the pieces I made until I started this cameo piece just this month. Brian and I do hope to visit the Pac NW sometime soon – way too much in the art (and metals) scene there currently to see! Thank you so much for stopping by and sharing such eloquent commentary w/ me. Dawn, I knew you would understand; thanks so much. I do plan to work more w/ this material. It’s really no different in its color and many other factors to say, porcelain or a natural fiber. I genuinely appreciate you dropping by and sharing your feedback w/ me! What a great and many layered statement you are making here! I love it Patricia! Sharon – that really means a lot – thank you. One thing I forgot to point out in my post above is that I’m attempting to show on the image of this female – that no one should try to place a square peg into a round hole. I laid out the photograph as a rectangle, but deliberately handmade a roundish oval frame around her. Soooo much of what our society does tries to place women into roles we may not be meant to do, nor desire to do. I know since your commentary is always so perceptive – you’d pick up on this right away! Not forgetting – the upcycling aspect of that soup bowl ‘fake ivory’! Sharon, I appreciate and always welcome your visits and feedback! Love that you have recycled the plastic packaging from your lunchtime soups! I also really enjoy the way you have re-energized these old 19th century forms for contemporary times. Patricia, what a fascinating story! I like your use of modern day microwaveables turned into old fashioned cameos. Much like the (art school word here) juxtapositions you did with the selfies in your jewelry work. Thanks for explaining this process. Glad it is being received with such success and recognition!!! Hollis. xox. On my phone; don’t know if my avatar will appear!!!!! Hollis – I always know I can count on you to understand the concepts and “throwbacks” from art history (and even pop culture) that I’m using here in my work. And you just made my day popping in here to say hello and share your lovely input! Congrats to you also on your opening this past weekend! Patricia, this is such a statement, and so creative! I love that you’ve, very successfully and beautifully, transformed something so mundane as a soup container into a very elegant piece, so carefully crafted. It’s great to see that you continue to explore your “Victorian” themes in such a meaningful and relevant way. It pleases me to know that you’ve picked up on and noticed that although the materials I used (i.e. soup bowl fiber material, thread, paper) are so plain and ‘everyday’ – I did invest quite a bit of time in crafting each individual element. For the exception of the found-object shadow box frame, each ornament was cut/sawed by hand, the archival paper photo pierced in specific places then arranged into this composition. Coming from such a thoughtful jeweler and artist like you – your comments here are so valued, Dominique!! Thanks so much for stopping by. What a clever idea Patricia, I loved that you have upcycled your container and who knew that lunchtime soup could inspire such creativity! Jen, how lovely to hear from you! Yes, it’s amazing when one eats as many soups as I have for lunch – how the mind starts to wander, hehe. I love the pics you just posted of your new place – to live along the Yarra River must be incredible! I’m so glad you stopped by and said hello! Great article, Patricia. And a tip of the hat for reusing material that almost anyone else would toss. Thanks, Neil – I appreciate your nice feedback. I’m so glad that you understand precisely what I’m driving at in (re)using this material! It has so much potential and more pieces are underway.